The month of February, Valentine's Day, and everything pink, white, and red has sped right on by and landed us at the beginning of March. Unfortunately here in Illinois, also known as the land of temperamental weather, Winter has not sped by as fast as February did. We're still getting freak snow and ice storms in between 50 to 70 degree weather. Go home Illinois, you're drunk! Before we know it the next major holiday will be here: St. Patrick's Day. Ever since I was younger I've always felt a certain draw towards Ireland. At one point when I was healthy, I actually wanted to go to college in Ireland; part of me still would love to fulfill that strange dream if at all possible. Actually, I just want to live there, if only for a little while. Maybe I'll be able to figure out why, oh, why I feel such a strong draw to that particular place one day. "There's nothing so bad that it couldn't be worse." I nearly cried. I felt guilty. I was a hot mess, figuratively and literally. Then I realized things happen and it could have been worse. If I had to throw it all away I would but not before I at least tried to salvage the situation. So with my best try, I brainstormed and remembered I had a container of Glutino gluten free chocolate cream cookies and a light bulb went off. Thanks to a Pyrex baking pan and Glutino, I turned an overflowing cupcake disaster into a downright delicious cake! 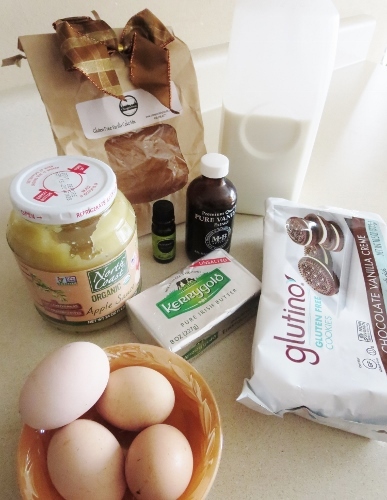 *Depending on what baking mix you choose your needed ingredients will vary. Make sure to keep that in mind! The different mixes also have different serving sizes. *I had Pamela's vanilla frosting mix on hand but ingredients will also vary depending on what you choose. 1. Preheat your oven to 350 degrees. Grab your preferred baking pan (I used a 8x11 glass Pyrex rectangular pan) and grease it up with whatever you prefer (cooking spray, butter, etc). 2. Add dry cake mix to a large mixing bowl. Add butter, eggs, vanilla, milk, and applesauce and carefully mix until batter is all smooth. Add your peppermint essential oil and stir. Since essential oil is strong, there is only need to add 2 to 3 drops to the batter. Pour into your respective baking pan(s). 3. Once in the pan(s), break out your package of Glutino's gluten free chocolate vanilla cream cookies and take out 6 to 8 full cookies, place them in a clear zip lock bag, and use a rolling pin to crush them into small to bite sized pieces. Dump the crumbled cookies into your batter and stir until evenly distributed. 4. Place in oven and bake for 45 minutes (or however long your baking mix instructions specify). Once done, take out and let cool for 5 to 7 minutes. 5. 10 minutes before the cake is done or while the cake is cooling, it's time to make the frosting. I used Pamela's gluten free vanilla frosting but you can easily use something else or make frosting from scratch if you wish. Once done, add 1 to 2 more drops of peppermint essential oil and mix thoroughly. Spread frosting across entire surface of cooled cake. 6. Take out 4 to 5 more vanilla cream cookies and crush them like you did when we added them to the cake batter. Once crushed, carefully spread them evenly across the surface of the cake making sure they stick to the frosting. 7. When done with the layer of crushed cookies, break out your package of Guittard green mint baking chips and pour 1/4 cup into a microwave safe bowl. Pop bowl into the microwave and microwave in increments of 15 seconds, stirring in between increments, until melted. 8. 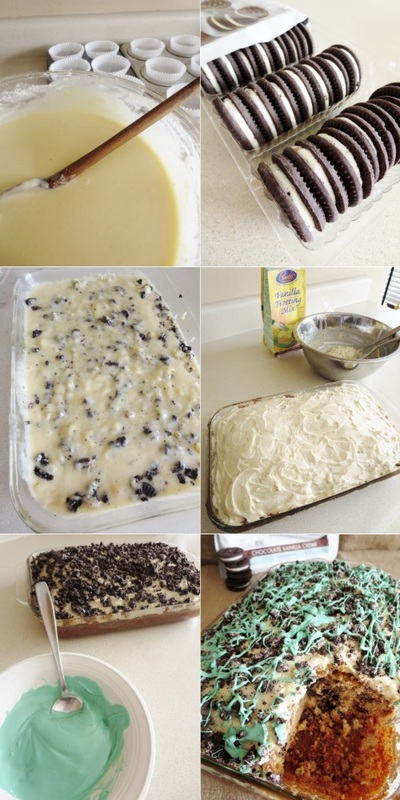 Dip a spoon into your melted mint baking chips and drizzle across entire cake's surface until desired amount is achieved. Thankfully this big blogger oops was saved by some quick thinking and a container of Glutino's gluten free chocolate vanilla cream cookies. I wasn't quite sure the overflowing cupcakes would be salvageable but I was more than pleasantly surprised at the outcome! My family was pretty happy with the result as well; I made this cake on a Monday and by Friday it was pretty much gone. I guess that's the best compliment a cook and/or baker can get, right? What was your biggest cooking or baking oops? Were you able to salvage it? Oh wow, this cake looks amazing! Thin Mints are my favorite cookie and so I am sure I would love this cake. I think my girls would enjoy it too. We might just have to make it some day soon. Awesome fix on your Gluten Free Mint & Cookie Vanilla Cake! Truth be told it looks much more spectacular as a cake than cupcakes. I too have Pyrex save me countless of times! Maybe you have Irish ancestors that's why you are so drawn to Ireland, who knows, right? I've had baking and kitchen fails far worse than what you had experienced! Good thing you were so quick about what to do next! The dessert looks so good! Your overflowing cupcake disaster is pretty much how all of my baking attempts turn out. The cake looks absolutely incredible though. I might have to try and make this. Oh my goodness! This sis what I want! This would be perfect on my cheat day. This cake does look very tasty and good!! I've never seen any mint desserts lately and I love mint!! If you want to live in Ireland, I want to live the rest of my life in Sicily! I am sorry your cupcakes did not turn out the way you wanted, but you sure did a good job with the cake! This is amazing, such a delicious cake & I love how creative the output is. 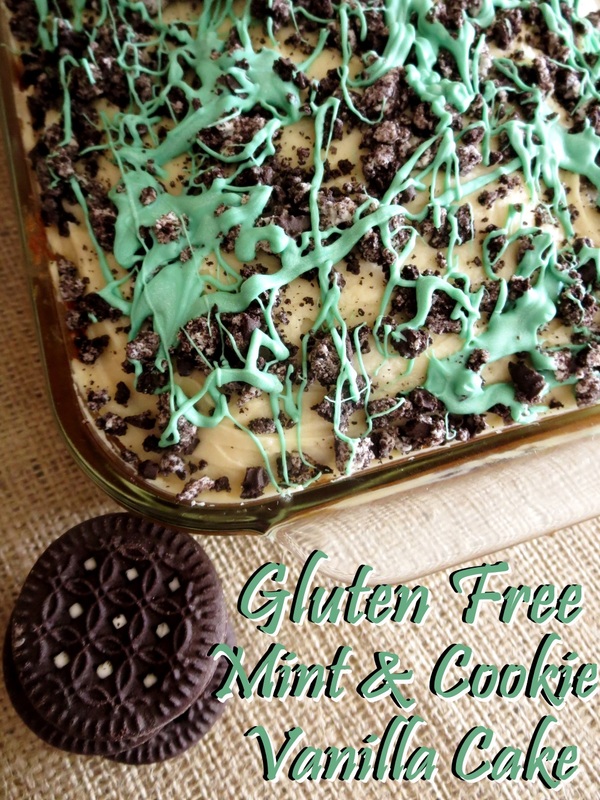 The Gluten Free Mint & Cookie Vanilla Cake makes it a great combination that anyone would love right away. It used to usually snow in March in Michigan. I do not miss it a bit. Yay for this recipe. Yummy heavenly treat! You kept your calm and use your head, quick thinking on your part. I haven’t had the chance to bake for a long time now thanks for inspiring me. Haha! I am laughing because this is all my baking disasters! In the end it looked fantastic!!! That cake does sound really good. I always keep a few gluten free mixes on hand since my daughter is gluten intolerant. You never know when something unexpected will happen!